Wendy and Norm Alvarez lost their home to the Carr Fire earlier this summer. Low-income people often face more challenges when it comes to recovering from a natural disaster. A paper published last year by the National Bureau of Economic Research analyzed 90 years of natural disaster data. It found that major catastrophes increase a county's poverty rate — the percentage of people living below the poverty line — by an average of 1 percent. That's because disasters encourage those who are well off to leave, and it makes those with low income poorer. In Redding, Ca., Wendy and Norm Alvarez had a unique living arrangement. Norm is a carpenter and had taken care of an antique dealer's house for years. The place was on a scrubby country road on the outskirts of town. It had a workshop where Norm did small jobs for other clients, and it had an in-law unit. Two years ago Norm and Wendy moved in. It was an ideal setup, one that they thought would carry them into a fairly comfortable retirement. "It was peaceful and quiet to sit out here in the evening with all the trees and birds and animals," Wendy said, "We had a good life." 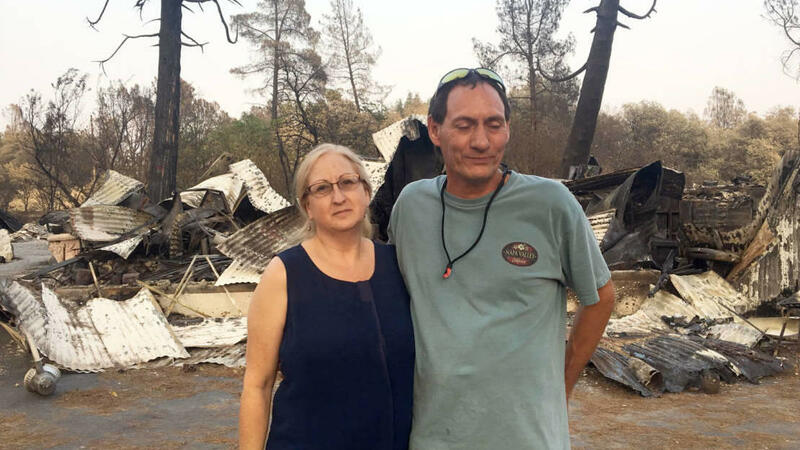 About a month ago, the Carr Fire forced Norm and Wendy to evacuate. The next day they were watching the news and saw footage of their neighborhood. Some of the houses were untouched. Theirs was completely destroyed. Nearly everything they owned was burned. Wendy said she felt like suddenly they might never recover financially. And she's right. They might not. The set back has been tremendous. Not only did they lose their possessions, their affordable living situation and Norm's caretaking arrangement, they also lost what Norm used to make money: his tools. All he has left is a drill, which happened to be in his truck when they fled. Like many who lost homes in these fires, the couple did not have renters insurance. For the first time in their lives they had to ask for help. "Financially we are in a position we haven't had to be in," Wendy said, "It's been very uncomfortable to humble yourself to ask for help." In the immediate aftermath of the fire, organizations like the Red Cross, the Buddhist Tzu Chi Foundation and the Lion's Club gave them some money for food and clothes. The Federal Emergency Management Agency (FEMA) helped cover a few months rent. Right now they're splitting rent on an apartment with other fire survivors. "None of us know which direction we're going to go," Wendy said. Wendy and Norm need to start generating income. They're trying to scrape together money to buy Norm tools so he can get some work helping others rebuild. All of their losses have made it hard for them to even think about a long-term plan. "It strips you from the inside out," Wendy said, "It doesn't leave you feeling like you have any value. You don't have any hope left to go forward. I am a godly woman, so I ask God every day, 'give me the strength.'" The longterm effects of natural disasters like fires on families quickly add up for a community. In Shasta County, where Wendy and Norm live, the percentage of people living below the poverty line is 17.5 percent. To the south, in Mendocino, it's close to 20 percent. Next door in Lake County it's 25 percent. These counties have been pounded by wildfires since the drought that began in 2011. Since that fire season, well over half of Lake County, for instance, has burned. Just this year, the Carr Fire in Shasta County and the Mendocino Complex Fire destroyed over 1,300 homes. Many of those who lost their homes may never fully rebound financially. Good jobs and affordable housing are hard to replace in rural Northern California. Losing a home can destabilize a family for years or even generations. Many fire survivors from previous years are still in limbo, like John and Ellen Brackett. John and Ellen's house in Mendocino County burned in the fires last October. They lost everything. The couple had two acres that John's grandparents had bought. They lived on the property with their two children. The place was all paid for, they just needed to cover taxes. The property was filled with three generations of stuff: tools, trailers and lots of motorbikes. John only saved his Harley — that's how he escaped the flames. Like Wendy and Norm, the couple had no insurance. After the fires, FEMA gave them $21,000. It didn't go very far. Ellen said they used almost all of the money just to fix their well and get drinking water. They needed the well on their property to get a FEMA trailer. They have been living in the trailer since February. The walls are bare except for one small photo of the family. The family has no real savings. Ellen has a job doing in-home care. John was a sheetrocker. But a motorcycle accident and years of hanging drywall destroyed his shoulder. He just had surgery, and is in a sling. His doctor told him he's done with manual labor. John said he's the kind of guy who likes to give help, not receive it. But right now they need help. In Mendocino, 402 families lost their homes last October. Only one family has rebuilt and moved back in, according to a local organization called Mendocino Rebuilding Our Community. Around 50 families like the Bracketts are living in FEMA trailers or even tents. You only get a FEMA trailer for 18 months. Ellen and John will lose theirs next April. If they don't have a home by then, Ellen said they will have to live in a tent. "We have be done with our plan by April," Ellen said, "We have to have a place out here. Because my kids, his mom, I mean we can rough it in a tent, but a 15-year-old, a 12-year-old and a 70-year-old? They cannot be in a tent." Mendocino Rebuilding Our Community estimates it would take around $9 million for everyone to rebuild. The group has raised $3 million. The state plans to start issuing a handful of low or no interest home-building loans. Ellen and John are praying they're one of the lucky few to get one. "Hopefully we will get approved," Ellen said, "and then, we're just going to slap in a five-bedroom modular, and hopefully get our lives back together. Because this is crazy." In the couple's bedroom they have a large plastic storage tub. In it, John keeps the remains of stuff his family has collected over the years: small antiques, coins, very old guns and knives. These few things may not have been worth that much, but they give Ellen and John a sense of security. They thought they could sell some of this stuff in a pinch. One thing of value survived the fire: a 100-year-old gold dollar coin. "This one piece amongst all of this is kind of like a hope," Ellen said, "There has to be. This can't be what ends it. There has to be something better." Fires have already destroyed nearly 1,400 homes in California this year, the latest in a string of blazes that have ravaged the state in recent years. As with all natural disasters, the people who end up suffering the most are those who had less to start with. From member station KQED, Sam Harnett has the story of two families in Northern California at different points in the struggle to start all over again. SAM HARNETT, BYLINE: Wendy and Norm Alvarez lost everything in the wildfire that swept through Redding earlier this summer. NORM ALVAREZ: That's the shop area. That's just (unintelligible). WENDY ALVAREZ: Yeah, there was a wall here. I'm going to step down over on the other side to the other room. N. ALVAREZ: This was our garden. HARNETT: They lost their possessions, their affordable living situation, even what Norm used to make money, his tools. N. ALVAREZ: Yeah, table saws, chop saws, generators, ladders, all that. It's history. HARNETT: Norm's a general contractor. All he has left now is a drill that happened to be in his truck when they fled. Wendy and Norm rented a house in Redding, about three hours north of San Francisco. It's a rural area where good jobs and affordable housing are hard to replace. The couple's in their 50s, and they thought they were set for retirement - not anymore. W. ALVAREZ: Financially, we are in a tough position that we haven't had to be in. And that has been very uncomfortable - to humble yourself, to ask for help. HARNETT: Like many displaced by the fires, the couple didn't have renters insurance. Local nonprofits gave them some money for food and clothes, and FEMA helped cover a few months' rent. Right now, Wendy and Norm are splitting an apartment with other fire survivors. W. ALVAREZ: None of us know what direction we're going to go. HARNETT: Wendy and Norm may never recover financially. A study published last year by the National Bureau of Economic Research analyzed 90 years of national disaster data. It found that major disasters increase the poverty rate. They encourage those with means to leave, and they push the low income deeper into poverty as they struggle to recover. John and Ellen Brackett lost their home a year ago, and they're still in limbo. HARNETT: The couple owns 2 acres of land and had a house in Mendocino County. It had been in the family for three generations. Now the couple is living in trailers. E. BRACKETT: These are our lovely ghetto FEMA trailers. HARNETT: How long you been in here? JOHN BRACKETT: Yeah, something like that. HARNETT: Their property was packed with old vehicles, trailers and motorbikes. That's all gone. They couldn't get insurance for all that stuff. After the fires, FEMA gave them $21,000. They used all that money just to get fresh water. E. BRACKETT: Just for our well was almost all the money we got from FEMA. HARNETT: The family has no real savings. Ellen has a job doing in-home care, and John was a sheetrocker. But a motorcycle accident and years of hanging drywall destroyed his shoulder. He just had surgery, and his doctor told him he's done with manual labor. J. BRACKETT: I'm one of those kind of guys that like to give help. I don't like to receive it. I like to give it. J. BRACKETT: I've been to prison half my life, and I got out and I started doing good (sighing). E. BRACKETT: Yeah. He started doing really good and then just loses everything. HARNETT: Over 400 families in Mendocino County lost their homes to fire last October. According to a local community organization, only one has been rebuilt. Around 50 families like the Bracketts are living in FEMA trailers. Ellen and John are hoping to get one of a handful of low-interest rebuilding loans from the state. E. BRACKETT: We're just going to slap in a five-bedroom modular and hopefully get our life back to normal 'cause this is a little crazy. HARNETT: And the clock is ticking. FEMA only lends out trailers for 18 months. Ellen and John lose theirs in April. If they don't have a house by then, Ellen says the couple and their two kids and John's mother are going to have to live in tents. In Mendocino County, I'm Sam Harnett, NPR News. (SOUNDBITE OF AUSTRALIA'S "EXHALE") Transcript provided by NPR, Copyright NPR.